The SapphireOne projects mode allows for an even greater level of control over the tracking of revenue costs, inventory and resources which are related to a specific task or job. The job projects mode is designed to be adaptable to your individual business requirements. SapphireOne job projects will provide for a level of control over your costs, including materials and labour, to allow greater flexibility over the production process, so as to maximise project margins. The use of a project ID code unlocks powerful functionality within the job Projects mode of SapphireOne. The project ID code can be allocated to individual products or batches of stock, or a larger job can be divided into individual projects or tasks so that profitability can be tracked as the work is completed. Business intelligence can be accessed on profit potential at all times during the stages of production. The project mode is structured in the same way as other modes such as inventory and accounts. This menu is used to perform all tasks involved with managing the project income billing and to track costs. Project financial reports are produced from this menu. Inventory may be allocated or reserved for a particular job or task, allowing greater control of your resources. While some costs remain fixed, labour is a key resource to profit from control over; it can be allocated and tracked in relation to specific tasks or jobs. A project financial report, similar to a profit and loss statement may be printed at any time. In this you may select, print and revenue costs assigned to a particular project ID reference. 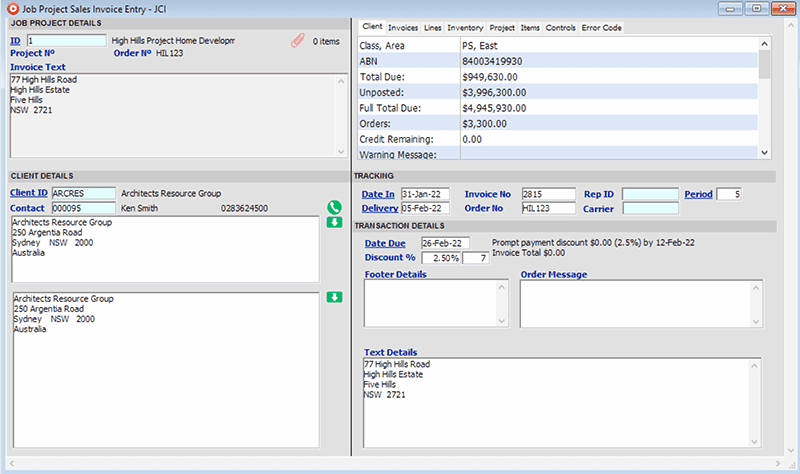 This Job Project Invoice function allows the creation of billing lines from Job Project Purchases and Resource Transactions using the Inventory file as a look-up. Complete write-off control or allocation to the Invoice for tracking purposes is controlled through this screen. To move to other fields, you can use the tab key or place the cursor in the required field by using the mouse. When a Job Project ID is entered, the corresponding client details including outstanding balance and credit limit are automatically loaded from the client master file and displayed in the Information Tab area of the Invoice. These details are not printed on the Invoice as they are for information purposes only. This area contains client information such as mailing and delivery addresses. These details are drawn from the client master file and include the different mailing addresses for the contacts listed in the file. This area contains information including Date In, Invoice No and Rep ID. This area is used to enter or display credit details and information, such as terms and conditions of sale which are to appear on the invoice. The footer details default to those set in the master defaults for the Inventory Mode. The Job Project Credit Memo is used to facilitate the return of goods or the issuing of credits for services supplied to a client. It works in the same way as a Client Sales Invoice but decreases all balances. Data entry for this Job Project Memo is the same as for the Job Project Invoice. There are seven Inquiry functions: Transaction Inquiry, Job Project Inquiry, Parent Project, Class Inquiry, Client Inquiry, Job Project Cost Inquiry and a Job Project GL Inquiry. you wish to work with and then use either the ‘modify’ or ‘look’ function from the main toolbar. The reason for the title Job Project is because the activity or function may be either a Job or a Project and, in either case, the tracking of costs and income is required for it. A Job Project may be set up as a standalone function or activity within the SapphireOne system and is then referred to as a Job Project. A Job Project may also be linked to a Parent Project. Once it has been linked to a Parent it will be referred to as a Child Job Project. The only difference when a Job Project is created as a standalone activity or function is that it is not linked to a Parent Project. The Job Project Cost Inquiry screen allows for the detailed analysis of the direct costs of a project. The displayed data can be used to produce reports so that specific data can be viewed and reported on. When this option is selected the system will list all General Ledger accounts that are currently in the Project system. The user will have to use the ‘find’ function to select the exact project that they want to display. For convenience, the most common ‘find’ would be the Project ID so this is listed first as may be seen in the screenshot here. The Post Invoices function presents a window that contains all current transactions awaiting posting. Only transactions for the current or previous period are displayed. When the transactions are posted they update the Inventory file creating the Sales Line data and CI transactions in Accounts Mode. When these transactions are posted they update the General Ledger. Enables the creation of billing lines from project purchases and resource transactions, utilising the inventory file as a look-up. Here SapphireOne also provides full write-off control or allocation to the invoice for tracking. Project invoice also allows for free-form text fields, custom fields on each line, layout style, shipping and FX details, in-built spreadsheet, drawing package, calc spreadsheet, write and the ability to add action notes. Once the project ID is entered, the corresponding client details, including outstanding balance and credit limit, are automatically loaded and displayed in the information tab area of the invoice. The information tab has been specifically designed for user information only, and are not printed on the Invoice. The “˜transaction details’ area is used to enter credit terms, and information such as terms and conditions of sale, which are to appear on the invoice. The project credit memo is used to facilitate the return of goods or the issuing of credit for services supplied to a client. It works in the same way as a client sales invoice, but decreases all balances. Credit memo also allows for free-form text fields, custom fields on each line, layout style, shipping and FX details, in-built spreadsheet, drawing package, calc spreadsheet, write and the ability to add action notes. The enquiry screen lists all current transactions in numbered sequence. A current transaction is generally classed as a transaction which is dated in the current month, is in the current period, is unposted, has not been 100% allocated, has not been reconciled and has not appeared within a BAS. SapphireOne also allows advanced search, sort, report and utility functions to be used in conjunction with the enquiry screens. The Project Enquiry screen can be used for searching, sorting and reporting. It can also be used to create, modify or look at an existing project throughout its life. All information regarding a project is shown within this option, including start date, estimated completion date and actual finish date. SapphireOne projects enquiries are not just limited to one screen. Within projects, the user is able to view or modify a number of screens pertaining to different aspects of the projects. These aspects include, but are not limited to, quote details, billing details, resource and inventory details. SapphireOne contains complete project management functionality that allows users to set up Project Tasks and manage the use of resources and inventory. An array of quote formats are available to send to clients after the initial project set-up. Users can easily review Project or Task Budgets against actual time frames and figures through the use of both a Project Gantt Chart and Project/Task Detail centres. Resource availability taking into account other projects and future leave can be easily tracked with a visual calendar allowing Project Managers to allocate the right staff. These can either be created on a dynamic basis using the Excel link feature, or they can be created at a later date. SapphireOne also allows the setting of revised budgets for each account, which can be used to reflect changes. Revise budgets in General Ledger account by period. The inbuilt calc spreadsheet facilitates this process. Add notes to individual project files to assist in tracking important information. All notes are date, time and user stamped for accurate record keeping. Notes are displayed in chronological order for rapid and efficient viewing. In addition to the standard demographic fields, SapphireOne allows you to enter searchable key words that relate to the project. The Costs Inquiry screen allows for the detailed analysis of the direct costs associated with a project. The displayed date can be used to produce reports so that specific data can be viewed and reported on. The reports that can be produced include balances and income and costs reports. These can all be searched, sorted and reported. The class enquiry window allows the grouping of projects in various classifications. This enables comparisons by grouping like projects and can assist in preparing future quotes/cost estimates. Client Inquiry presents a window that contains important details relating to a client, allowing easy selection of the correct clients for viewing. This is similar to the Client Inquiry screen in the accounts mode. This also provides the ability to search, sort and report. Reports are used to produce standard SapphireOne-designed reports. The Details Report and the Analysis Report also have the option to produce labels. All other reports can be customised with Quick Reports or Custom Reports. To use Custom Reports please refer to your Tools Reference Manual. SapphireOne provides the templates in Custom Report Layouts in the Utilities Mode with fields already defined. 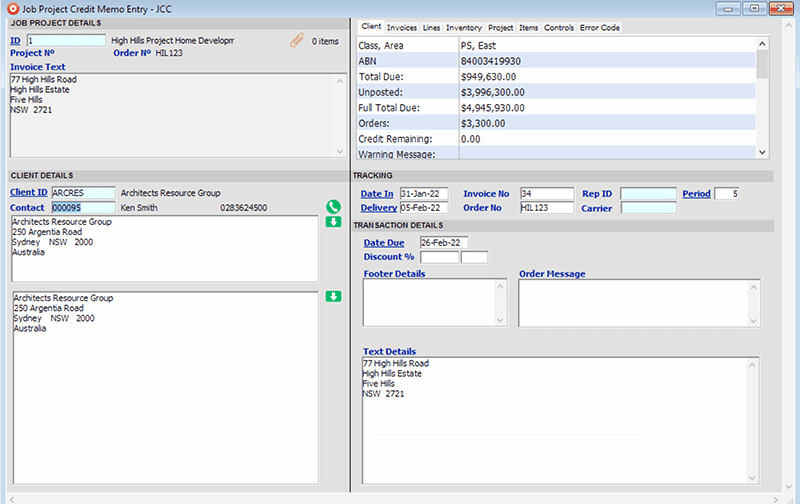 There are six reporting screens: Job Details, Job Cost, Job Analysis, Transactions, Invoices and Job Project Financials. The Job Project Details report produces reports about a Project which are similar to those produced in Vendors and Clients under this heading. The Costs report produces audit reports of any project and draws the data from the Project Audit Lines file. The Analysis report produces reports with totals for each project. These can be used for a comparison of projects. This Transaction report produces the standard internal Transaction reports and allows the entered data to be checked and/or amended prior to posting. The Invoices report option is used to print different invoice styles for clients. As with other print dialogue screens, Quick Reports and Custom Reports are both accessible from this print dialogue screen. This report produces management reports for each project. Project Actuals or Project Budgets may be printed from this report.